• Version used for the screen captures: WS.WebTV Professional 1.5.1, 1.9 and 2.0 (all extensions enabled). Some options/features might be different, respect your WebTV, depending on the installed version and extensions you have purchased. Upload the logo of your WebTV in JPG, GIF or PNG format. If using PNG, the image can be transparent. We recommend you to use a logo for "desktop" viewing and another one, more squared, for "mobile" viewing (WS.WebTV 2.0+). If you do not provide a "mobile" logo then the "desktop" version will always be used. 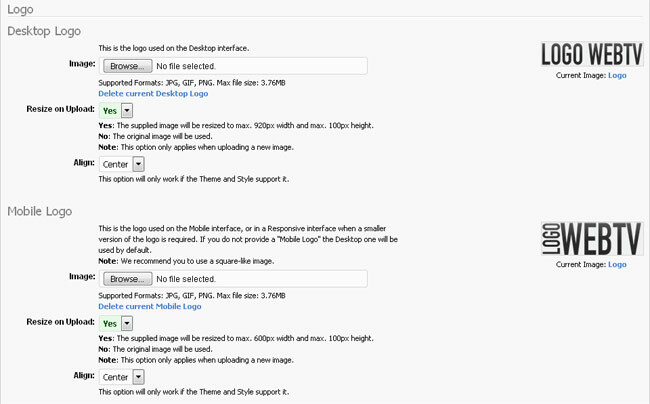 You can also specify if you want to resize the image or keep it original (when uploading); as well as the alignment. (Since WS.WebTV 1.5.1) Upload an image that will be used by default (if no other image is available) when sharing WebTV URLs on social networks like Facebook. To change the background of the WebTV. • Use Custom Background: To enable/disable the custom background. • Color: (Click to open the color picker) This is the background color. • Image: Upload an image to use as background. If the image is transparent, it will be composed with the background color. • Horizontal Pos: To control the horizontal position of the background image. 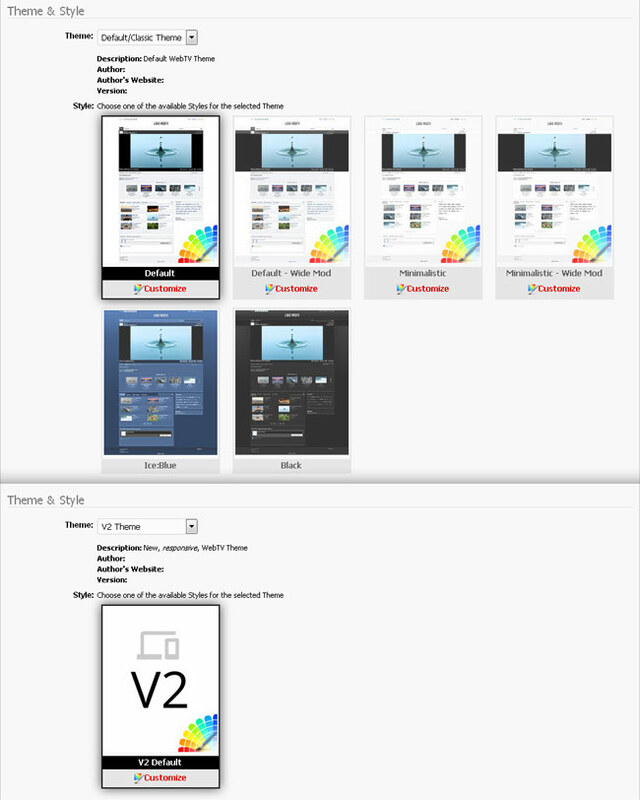 • Vertical Pos: To control the vertical position of the background image. • Repetition (Tile): Allows you to specify the repetition for the background image. • Attachment (Scroll): To control the attachment of the background image. Choose the WebTV theme and style. Additionally, since WS.WebTV Professional 2.0 the V2 responsive Theme is also available. • ... Creation Default: Select the default template used when creating Categories, Text Channels (Pages) and/or Video Channels. • ... Override: Select the template that will override the individual settings for Categories, Clips, Text Channels (Pages) and/or Video Channels. Select "No" if do not want to override.